As I prepare for my move at the end of the month, I’ve been thinking more and more about my decision to stay close to Vancouver. It is one of the very expensive cities to live in, but I feel at home here. Am I a fool for staying here when I can’t really afford it? Maybe, but I just can’t see myself living anywhere else in the world at this point in my life. What Makes This City Expensive? You could blame all those years of being ranked as one of the top cities to live in. Obviously there’s a reason this city gets those rankings though. Technically they make those lists based on the following criteria: stability, health care, culture and environment, education, and infrastructure. So it’s got those kinds things going for it. Generally it’s just a beautiful city with plenty to see and do. Plus it’s one of the few areas in Canada that gets very little snow. As a result of those benefits, rent prices and housing prices are very steep. With all the great restaurants here, dining out can really add up too. Also I’m a sucker for wasting money on things like concerts and sporting events, especially my favorite team the Vancouver Canucks. I used to go skiing a fair, but have cut back on that mostly due to the high price. All of those things add up to a high cost of living. Originally I moved from a small town in northern BC to the Vancouver area to go to college. Since I was taking an IT related program, I knew I would likely have to stay in a big city for the large number of job opportunities. Since I was already growing emotionally attached to the Vancouver area, I had no problem sticking around for work. So here I started my career, first as a programmer/webmaster and then later transitioned into website marketing. These days I’ve been working from home on my own projects, including this blog. Still, I know if those projects don’t work out, I will need to be in a big city to have a chance of getting an actual job. The other big reason for choosing to stay here is to be close to friends and family. Since I’ve always lived in BC, most of my family and friends are here too. Moving to another big city would mean living further away from them and really starting fresh. While I probably won’t live near Vancouver long term, it does look like I will be here for the foreseeable future. Eventually I’ll smarten up and move somewhere that will allow me to save for retirement easier. Now I’ll hand things over to the readers. Have you ever chosen to live somewhere expensive? How big a factor is price for you when deciding on where to live? By the way, I need to include a code to get my blog verified on Technorati. So here it is: K9NR77WA6BNG Feel free to ignore this. I’ve never lived anywhere too expensive. Where I live now is super cheap. You’re lucky then Michelle. It’s easy for high rent and a high cost of living to eat up most of your money. I live in Southern California, so it’s pretty pricey by most standards. HOWEVER – it’s not as expensive as San Francisco, New York, London, Moscow, Hong Kong, Boston, and Dubai. Whew. I feel better already. 😉 I’d like to spend a few years in a lower cost of living area (or somewhere without income tax) to get started, but that’s not a top criteria in determining where I live. I had always wanted to go move somewhere cheaper and get my own business going. Perhaps I’ll start to think about that more seriously. I think Vancouver is often included in that list of expensive cities. Most people in the blogosphere know I live in Hoboken NJ, which is right outside of NYC and very expensive. From 2004-2009 I lived right in Midtown Manhattan. I’ve certainly suffered from the high living costs here, but I still have managed to improve my net worth by over 50% of my after-tax income since 2004. Basically that means I’ve lived off of around 60% of my take home, saving 40% in varoius accounts and had some decent investment returns. It can be done anywhere. Actually, the high cost of real estate here has probably single-handedly made me a renter during the worst housing crash in recent history, so maybe I’ve benefitted by being intimidated by real estate prices… looking to buy now though. But the most important part of your post that I LOVE is the title – more particularly the first two words. Once people realize almost everything is “a choice” they generally end up better off in the long run. Good stuff Jeremy. Glad to hear that you’ve managed to do so well living near NYC. I think the key to living in an expensive city is taking advantage of the high paying jobs. I’ve been drifting back and forth between smaller companies where I’m comfortable but making a lot less money than I could elsewhere. While I do choose to live in an expensive city, I am gradually leaning towards the choice to live somewhere more affordable. It is just tough in my line of work unless I have my own business going. Yeah, I’m really fortunate to have a pretty good gig. We’re definitely… ahem… frugal… though. We set up so many auto-savings and auto-invests that it looks like we’re living off of a relatively small salary when almost as much is goin to building up my “eff you” fund… haha. By the way, sorry for everyone near Vancouver for jinxing us with the ‘very little snow’ comment. It has been snowing heavily all morning and looks like it might keep up all day. I’m just crossing my fingers that it doesn’t stick around till the end of the month when I’m moving. Living in an “expensive” city is a tough choice but I love the luxury of having many options close by. I grew up in a VERY small town and I don’t think I could ever do it again. I like have many choices when it comes to restaurants, shopping and medical service. Thanks for visiting my blog Walter. I think I may have similar reasoning behind staying in a big city. I also grew up in a small town. We had 1 movie theater, 1 fast food burger joint, 1 fried chicken restaurant, etc. Coming from that situation, moving to a big city and all the selection available is just too tough to give up. We moved from a modest-priced city in the United States to one of the highest cost-of-living cities in Australia last year. I was really nervous about the change, but I’ve found that we have much higher incomes and a better quality of life here. If you do get much higher income as a result, it probably is worth paying for the improved quality of life. If you don’t mind me asking what city in Australia did you move to? I visited the area from Sydney to Brisbane a few years back and it’s a really great country. I’ve lived in Barbados all of my life and it is expensive. I love living here to some extent, but I would love to spend at least one year in another country. I deal with it by being price conscious and shopping overseas. It is tough to leave somewhere when you’ve lived there your whole life. It is human nature to stay where you are comfortable. Is your rent expensive or is it just the cost of food and other necessities? Any idea what country you might want to move to? I had similar considerations when I decided to move to Houston 15 years ago. At that time I was living in El Paso, Texas which has a very low cost of living, which is compounded by a low earning potential. In short, it costs less to live there which is good because you won’t make very much while living there. So, when I was finishing grad school, it was time to move on both professionally and personally. I decided I wanted to stay in Texas so I would be reasonably close to friends and family, so the top two cities that I considered were Austin and Houston. Houston won out for several reasons, not the least of which was that it has a lower cost of living than the state capitol. I would estimate that cost of living was about 25% of the reasoning behind my choosing Houston over Austin. The others were location, earning potential, and closeness to the beach in Galveston. Hi Mike. Thanks for sharing the story of your similar move. It’s probably a fairly common situation for people once they finish college or grad school. Now that you’re all educated, it is time to go try to find a high paying job. I guess you were able to land a good job in Houston if you are still there 15 years later. It sounds like a great city. I’ve never been there. Even though it is very important to save and build your finances, it is still good to live in a great place. If you moved away and there was a lot less to do, you might not feel as good about your life. I’ve always liked city life, you can always find interesting people. Far away from the city, the options may be more limited. I live in a resort community, so I know what it’s like to live in an expensive area. Everything from gas to housing is substantially more than an hour down the rode, but it can be worth it if you like what your community has to offer! Yes resort communities can be even more pricy than a big city. I notice that when I visit my sister up in Whistler. I guess since where you live plays such a big role in happiness, it is one of those priorities that you can justify paying more for. I was born and grew up in Vancouver for most of my life, but then also had a chance to live in Melbourne, Australia, and London, England for 1.5 years each (we were gone for 3.5 years total.) I think it would have been easy to live in Melbourne, or even stay in London, but both our families are in Vancouver, so its the best place for us to start a family being close to our family, so we moved back. 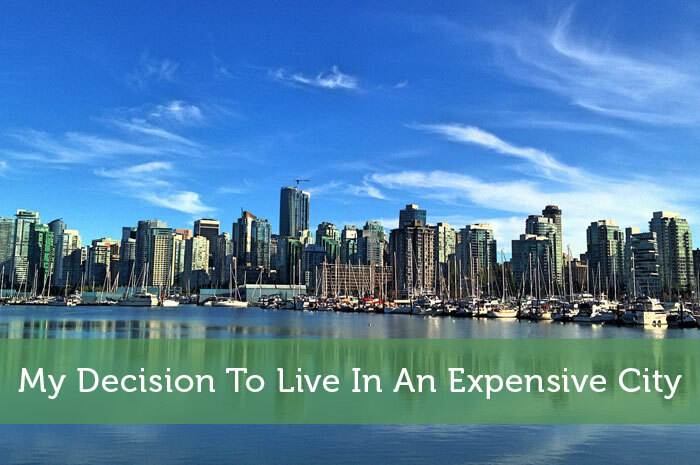 London is an expensive city to live in (compared to salary, rent, food) compared to Vancouver. Thanks for checking out my blog sleepydad. Always good to see more Vancouver bloggers on here. Yes I’ve heard London is pretty expensive. I’ve never been there, but I need to do a trip across Europe sometime. Seattle isn’t cheap by most standards, but not nearly as expensive as Vancouver. I’ve lived here my whole life, so when people in the mid-west test me they bought a home for $150k, I’m always amazed. Vancouver is a great city, I’ve always liked the fireworks festival. I am awfully found of Victoria too, though I couldn’t live there until I got too old to snowboard. Speaking of which I’m planning a trip up to Whistler in early April, we’ll have to compare schedules and see if we can grab coffee. Seattle is a great city too. I’ve enjoyed it the few times I was down there. I do get pretty jealous when I hear of people in other cities buying decent sized houses for half the price of an apartment here. Definitely give me a shout if you’re in the area. Do you go up to Whistler much? When you consider the relatively high pay scales in expensive cities they really aren’t a bad deal if you can avoid all those temptations and live frugally. So, if you end up going back to work in the future living in Vancouver will certainly be to your benefit. While you are living off a smaller income from your own gigs though I’m not sure it makes sense. We recently decided to pick up and move from Bangkok (expensive) to the smaller and more affordable city of Chiang Mai. We will be giving up some perks and conveniences, but we feel in the long run it will be much better for us. Only you can decide if the cost of living in your city is worth it. Yes not having a daytime job is the big reason I second guess my decision. Financially it might more sense to move somewhere cheaper, but then what happens if I need a job again? I might end up getting stuck with a long commute or be forced to move again. Within 2 or 3 months I’ll probably re-evaluate things and take on at least part time work if necessary. Vancouver & Victoria are both beautiful cities. I’ve been there many times. I think one of the initial things that made them so famous was the mild weather year round, except of course for weekends like this, where it just snows and snows. My husband and I live in a very expensive city in Canada as well. We both initially moved here years ago for job opportunities. Over the last 4 years we have been talking about moving simply because of how expensive it is to live here. So far we haven’t found an alternative. I feel like there are so few options in Canada compared to the U.S. I would love to live in a quaint & charming small town somewhere (somewhere where it never ever snows! Ha..ha…). Well hopefully your careers are flexible enough to make that kind of move possible. For many careers there isn’t much opportunity outside of big cities. As for avoiding the snow in Canada, the closest to that is probably somewhere on Vancouver Island. Small towns do have financial benefits, but be prepared to dear with other drama of knowing everyone in town and knowing about everyone’s dirty laundry. At least people are friendlier without the cover of anonymity. I love Vancouver, and I’m also not from here originally, but I don’t see myself moving out of this area in the foreseeable future. It’s expensive, but I wouldn’t be able to get the boy to move anywhere out of BC, and BC in general is expensive. We have it good here – I have job opportunities, he has a lot of work. But I often wish our rent was lower. When you’ve got a business that was making more than enough to get by on, it is just too tempting to try to make it work, even if that income drops a lot. We’ll see what the next month or two holds with my other projects. I feel your pain, Jeremy! I’ve been living in Toronto now for four years, and it is insanely expensive. For me, it was a school/career move, as it’s one of the primary hotspots for my industry. That, and I’m also closer to my hapless Leafs..
I’d love to make it out west in the next few years! Well if the Leafs are one of your reasons for living in Toronto, you should head west 🙂 I don’t think they’re gonna get much better anytime sooner. When they make so much money with a losing team, there really isn’t much incentive to get better quick. Living in a big and expensive city, like Vancouver, would really be hard if you have a low paying job. And when you want to get a good one, the competition is tough too. I really wanted to visit that place but I don’t see myself living in it.